The Buffalo Bills have landed the kind of veteran wide receiver they have coveted all offseason. The Bills announced Monday that they have signed wide receiver Anquan Boldin to a one-year deal. Boldin’s contract comes with a base salary of $2.75 million and includes incentives that could make it worth as much as $4 million. The Bills have been lacking in the wide receiver department in recent years, and Boldin should be an immediate upgrade. While the soon-to-be 37-year old Boldin is no longer in the prime of his career, he proved last season that he can still be a productive wide receiver in the NFL. In 16 games with the Lions last year, Boldin caught 67 passes for 584 and eight touchdowns. He had 15 catches in the red zone, which was the second most in the NFL last season. Historically, Boldin is 14th on the all-time list in receiving yards in NFL history. He begins the season tied for 23rd with the most receptions in NFL history. He is second and third, respectively among active players. in those categories. On the surface, signing a wide receiver at this stage in the preseason would indicate the Bills are unhappy with the performance of their receivers thus far in training camp. However, Buffalo GM Brandon Beane insists that is not the case. That being said, Boldin does appear to have the chance to earn a starting spot by Week 1. Sammy Watkins is poised to be Buffalo’s no. 1 receiver this season. But the no. 2 wide receiver spot alongside Watkins appears to be up for grabs, giving Boldin the opportunity to be a starter in his 15th NFL season. Also competing for time at wide receiver will be Andre Holmes, Corey Brown, Brandon Tate, Rod Streater, and rookie Zay Jones. None of those receivers came close to matching Boldin’s production last season. Of course, the Bills gave Holmes a multi-year deal over the offseason and are high on Jones in his first NFL training camp, so the veteran will face some competition. 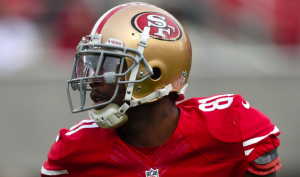 If nothing else, Boldin can expect to see plenty of action as Buffalo’s no. 3 or no. 4 receiver. Obviously, Boldin doesn’t have the same kind of ability or explosiveness that he had earlier in his carrer. But last he showed that he can still be a productive receiver, even if he doesnt’ create as much separation as he used to. Boldin also brings experience, leadership, and has long been a pillar of the community in whatever city he plays. For a team like the Bills with few proven commodities at wide receiver, Boldin is an excellent addition.